Here we have a cute birthday outfit for all those little boys who love Caillou and are having a Caillou birthday party. As many know, Caillou is the main character in a child's television program based on the books by Canadian author Christine L'Heureux. Caillou is 4 and is fascinated by the world around him. He has many adventures with his family and friends, and uses his imagination in every episode. So, we used our imagination (and the ideas of a customer!) to design this outfit. We start with a royal blue gingham fabric and make a John John or longall. The shoulder straps of the John John and longall fasten with red buttons. You can also choose to have a white shirt and royal blue gingham trousers outfit. 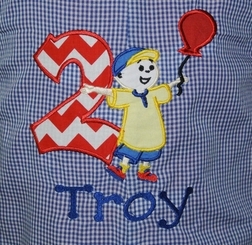 The fronts of the outfit and the white shirt are appliqued with a red chevron number signifying the age your little one is celebrating. Caillou is appliqued in his usual colors of yellow and blue, and has red shoes and is carrying a birthday balloon. Your little one's name is monogrammed below the applique in royal blue Tinker Toy font. To bring out the red chevron in the number, the hems of the outfits and the shorts or pants have red chevron cuffs.